Among those celebrating exam success is girls' education campaigner, Malala Yousafzai who gained a string of As and A*s in her GCSEs. 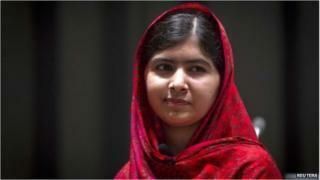 Her father, Ziauddin Yousafzai, took to Twitter to list Malala's grades which include A*s in GCSE and iGCSE maths. "My wife Toor Pekai and I are proud of Malala getting 6A*s and 4As. #education for every child," wrote Mr Yousafzai. Malala was shot by the Taliban after writing a diary about life under their rule in North-West Pakistan. Last year, she became the youngest person ever to win the Nobel Peace Prize. The 18-year-old, who now attends Edgbaston High School in Birmingham, did particularly well in the sciences, with top A* grades in biology, chemistry and physics - as well as in religious studies. Malala first came to public attention through her anonymous diary, published on the BBC's Urdu website, in which she chronicled her desire for girls in Pakistan to have the chance of an education.